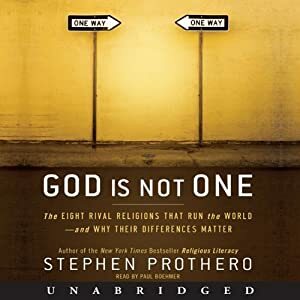 Stephen Prothero argues in God is Not One that there are important differences between religions and we should attend to them. He takes no stance on which religions are better than others, but he does rank them in terms of current importance, starting with the most important and going on down. His list is Islam, Christianity, Confucianism, Hinduism, Buddhism, Yuruba, Judaism, Daoism, and then a short chapter on atheism. He argues that we need to take the differences seriously rather than minimize their differences. He believes that the different religions need to understand each other better, and he often argues against dogmatism. While he is mainly non-judgmental about religions, he does save some criticism for the group he calls "angry atheists" -- the predictable group of writers including Hitchens, Dennett, Dawkins, and Harris, making it clear that their criticism of religious belief is as bad as the dogmatism they are criticizing. So Prothero wants a reasonable conversation between different points of view. He does not hold any portion of religion beyond criticism, and clearly he thinks some religious practices are problematic: he discusses the exclusion of women and the role of violence in some, for example. Yet for all religions he believes that we need to be open-minded and ready to enter into dialog. Maybe the most interesting feature of Prothero's approach is his emphasis that religions are not necessarily defined by their doctrines, and that religious practices, stories, and traditions can be just as, if not more, important. His description of the eight different religions focuses on some of the practices, stories, and traditions as well as their claims about the nature of God and the afterlife. He also discusses some of the differences within religions, such as different branches of Islam and Christianity. His discussion of the Yuruba, Confucianism and Daoism religions is especially interesting for those already familiar with the main elements of the other five religions. As an introduction to world religions, this is a very approachable book. This is a more personal discussion where Prothero brings in his own experience and opinions and tends to adapt the way he sets out information according to his relation to the religion in question. People looking for a more systematic and scholarly approach with footnotes would probably want to use a textbook. Listening to the unabridged audiobook is an enjoyable experience: the performance is solid and consistent.